For those who have little time to spend in Pantanal but want however to experience the wildlife of the area, the route 3 is what you need. In fact, it gives you a comprehensive and exhaustive overview of the place in just three days. Everything in comfortable and cosy pousadas. Stages: Cuiabà Airport; Start of tour in Poconé; Accommodation: Pousada “Estancia Vitoria”. 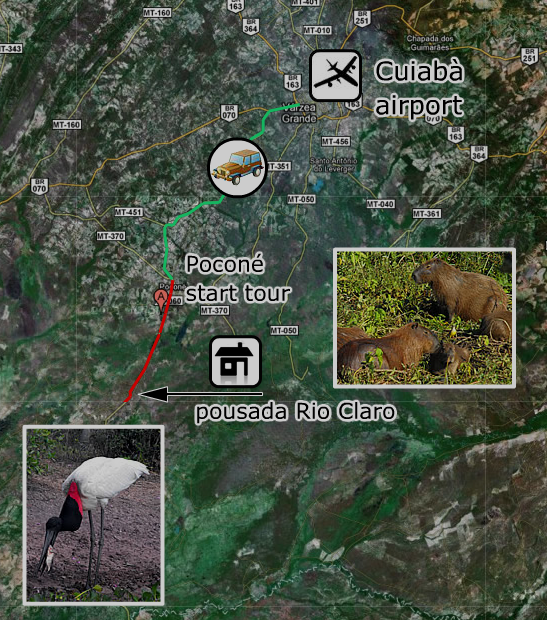 Conditions: The cost of the Tour through Pantanal includes transfer to/from Cuiabà airport or town, all transfers mentioned, stay in pousada by full board, daily excursions with a bilingual guide. Departure for Poconè (the capital of the Pantanal), short visit of Poconé, lunch at Churrascaria (not included) and departure for Pousada “Estancia Vitoria”, already inside the Pantanal, and first knowledge of the Pousada. In the evening, after dinner in pousada, there is a short night safari, during which you could bump into various animals and night birds, including ocelot. Departure in the morning for a walk or ride (optionally) inside the pousada (the entire pousada has an extension of about 3000 hectares) where you could appreciate the characteristic caymans of the Pantanal (Jacarè), the Jabirù (or Tuiuiu, the symbolic animal of the Pantanal), the capybaras (the largest rodent in the world) and innumerable bird species. You will have lunch in the pousada and, in the afternoon, you could go for a canoeing tour along the river nearby; then you are allowed to blissfully fish in the most abounding in fish waterways in the world and where you could see the fearsome piranha. Dinner and overnight stay in Pousada. In the morning, an ecological walk is planned. Back to pousada for lunch and, in the afternoon there is a visit of a gold mining site and some craft stores in Poconè for eventual purchases of typical products and souvenirs; Then return to Cuiabà airport.